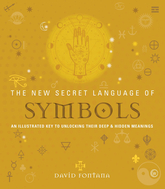 The New Secret Language of Symbols is a beautifully illustrated sourcebook of symbols and symbol systems. The introduction looks at the cultural and psychological explanations of symbols - including the Jungian idea of the collective unconscious. Then follows “The World of Symbols,” the heart of the book in which more than 500 symbols are presented and explained theme by theme -- from the elemental symbolism of the cosmos to the multiplicity of meanings associated with man-made objects and structures. Each overview is centered upon a major image that is decoded to expose its deeper meanings, thereby giving the reader revealing insights into the thinking behind some of the world’s most intriguing art, artifacts, and architecture.